First model of its type in Ohio specifically designed to care for newborns and provide referrals to mothers for community resources to equip them with the tools necessary to access or maintain a healthy standard of living. 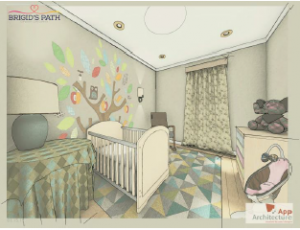 Welcoming, home-like facility will accommodate 24 private nurseries in four, charming pods with gathering spaces where mothers and families can find support, encouragement, and resources for healthy living. Education space intended to inform families and the community about a myriad of topics including addiction, parenting, housing, budgeting, parent and child bonding, safety, hygiene, and more.
? Brigid’s Path began as an idea shared by two friends, a foster parent and a daughter of two addicts, that there must be a better way to care for the growing number of babies born with Neonatal Abstinence Syndrome (NAS) in the Miami Valley. A community crisis deserves a community response. How is the Dayton region responding to this community crisis? 12,000 sq. ft. facility, valued at $270,000, was donated to our organization by a generous benefactor to be renovated for Brigid’s Path’s needs. ? Mead Johnson is providing all Enfamil formula for our patients. ? Respected neonatologist and Miami Valley Hospital Chief of Staff, Dr. Marc Belcastro offering his services as Brigid’s Path Medical Director without charge. Multiple businesses & churches are sponsoring nurseries or other areas to help meet the fundraising goal and increase awareness for the mission. ? Partnering with Wright State University School of Professional Psychology to provide quality care for our patients and their families, as well as provide research opportunities to improve long-term treatment options. From 2004 to 2013 there were approximately 7,623 NAS*-related hospitalizations in OH. In 2013 alone, there were nearly 5/day=1,691 total (1,475 were Medicaid discharges). ? NAS associated with over $97 million in additional hospital charges in Ohio in 2013. Average hospital charge increased from $31,514 to $57,897 from 2004-2013. Average inpatient charge for NAS infant is 4X greater than for all Ohio infants. ? Brigid’s Path projected to save at least $5 million in taxpayer funds by providing high-quality care at a substantially reduced charge. *NAS = Neonatal Abstinence Syndrome (NAS) is a group of problems that occur in a newborn who was exposed to addictive opiate drugs while in the mother’s womb.